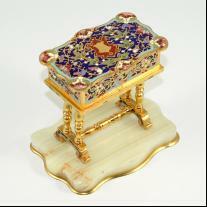 An exquisite sterling silver and guilloche enamel box. The rare opalescent yellow enamel over the most fine guilloche work. At the center of the lid a cherubs motif. Swiss, circa 1900.